In the early 1990’s. Fred Owen’s 19 year-old daughter was looking for an auction opportunity. Owen, a dairy farmer, organized and built the Homerville Wholesale Produce Auction in Ohio. In 2004, over 45,000 lots were sold. Cash flowing through the produce auction to small local farms has become a major contribution to the local farm economy. 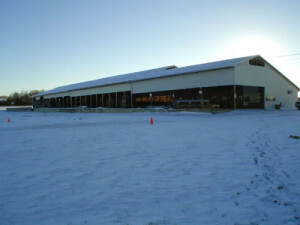 The auction building is located in Homerville, Ohio which is less than an hour’s drive from Cleveland and Akron, Ohio. Buyers are farm marketers, chain stores, and restaurants in the Cleveland/Akron/NE Ohio mega-market area. 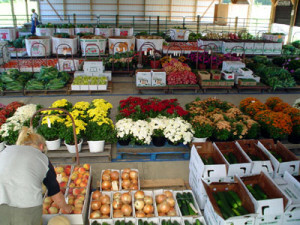 Sellers, or shippers, offer high quality locally- grown produce. Currently there are just under 500 shippers. About 50% are Amish, and they often deliver their lots by wagon load. 90% of the produce that is auctioned comes from about 100 larger growers. 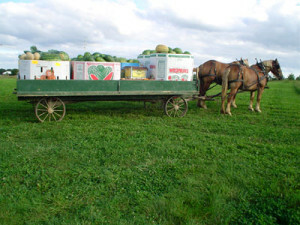 Most lots of produce are pallet-sized or larger up to full wagon loads. Over 90 auctions are held each year with usually three per week. Only locally-grown produce is sold. 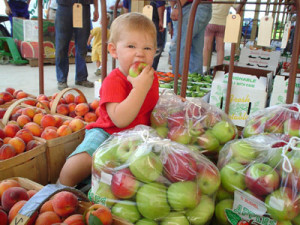 A young auction participant enjoys a healthy, locally-produced snack.